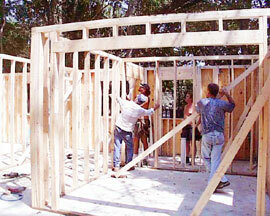 7:30AM Tuesday, the framers began to assemble the panels that make up the ground floor frame. Notice the anchor bolts at the edges of the concrete slab. The panels are individually numbered and are alligned with each other and the slab according to special instructions included with the frame package. 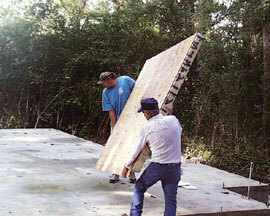 Here the first panel is being carried towards its place on the SE corner of the slab. Here, Jim and Pat, with “Hollywood” behind, are placing Panel 1 over the anchor bolts in the position assigned to it. First, holes were drilled in the bottom rail (the 2×4 at the bottom of the wall) positioned to align with the anchor bolts in the slab. 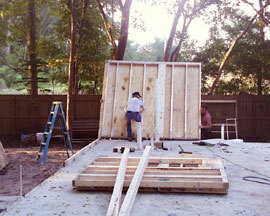 Once the panel was in place, carefully positioned, nailed and bolted down, one of dozens of spare 2×4 was nailed at an angle between the floor and panel to brace it. These three panels were accurately set in about 15 minutes. Two and a half hours later, the interior walls have been moved inside the almost-complete ground floor ready for installation and the last two exterior wall panels for the ground floor are being set in place. Note the front door opening that is lining up with the concrete slab that will be the porch floor. In the background are window openings and the fireplace. 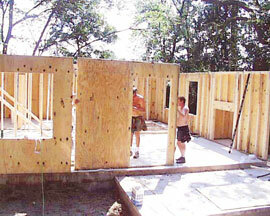 The interior walls were accurately manufactured and lined up in their assigned positions very well. There were some issues with the flatness of the concrete slab but the panels were perfectly square and true. It took 6 1/2 hours total to build the exterior and interior walls for the entire ground floor, including 2 hours making adjustments to compensate for the anomalies in the floor. 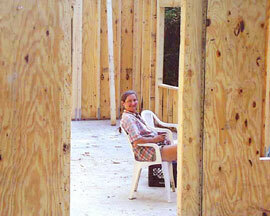 Barbie – a proud owner – luxuriating in a spot of tea within the walls of her new home at 3PM on the first bulding day. 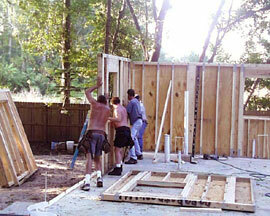 We were both very impressed by the speed of construction and quality of the framing package.